Brand: Brand: Charles Randall Inc.
View More In Professional Reference. Over 2,000 decorating ideas for windows, bedding and accessories- including draperies, shades, blinds, shutters, verticals, bedspreads, pillows, cushions and more. 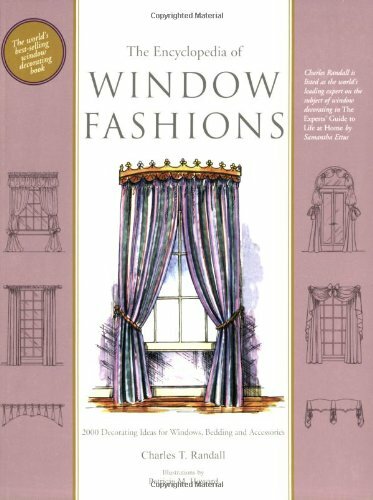 Blending current, popular styles with extraordinary new approaches, the fifth edition of The Encyclopedia of Window Fashions is a must have for designers, from beginner to expert.With more full-color illustrations than ever before, this book presents myriad window treatments for any room in any home from the most simple to the most challenging. Now 300 pages, which include detailed illustrations, cost-saving ideas, yardage and fullness charts and much more. Finally, a new comprehensive update for the book that has become the industry standard for decorators and homeowners alike. Now in its sixth edition, this all-inclusive pre-eminent decorating book has been reworked for the new millennium, including an expanded historical section, new styles and calculations, more comprehensive information about treatments and accessories, and of course, the visual index, a terrific means to colorize any window treatment or accessory in this book to your own interior color palette. If you have any questions about this product by Brand: Charles Randall Inc., contact us by completing and submitting the form below. If you are looking for a specif part number, please include it with your message. The Architecture Of Light: A textbook of procedures and practices for the Architect, Interior Designer and Lighting Designer.